Having been a little busy recently with wedding cake season in full swing, my blog updates have been somewhat infrequent. However my brother got married this weekend and what better excuse to put finger to keyboard than to show a picture of his stunning four tier wedding cake which successfully made the three hour trip from London to Wiltshire. They choose a four tier round grapefruit flavour cake which I was initially rather sceptical about but turns out with its citrus cream cheese frosting it tastes like a more subtle lemon with the yummy frosting normally associated with carrot cake. Judging by the reaction of the guests I think it might start making its way onto our cake flavour offering. 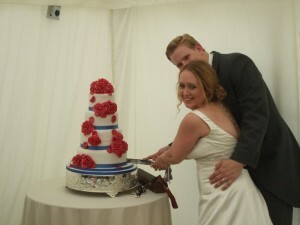 The wedding cake was covered in red sugar roses and petals and had a cornflower blue ribbon around the bottom of each tier. Simple but stunning even if I say so myself and my new sister-in-law looked fab too!